Discussion in 'Guitars in General' started by doobiebrother, Mar 5, 2008. Hi All - I'm looking for a bit of advice about the below guitar - as I don't know much about PRS's I'm hoping you knowledgable folks can help me out. I've got a chance to pick up this guitar for £1500 - It's a 2003 singlecut with the series 7 pickups and I've been told it's pre-lawsuit. 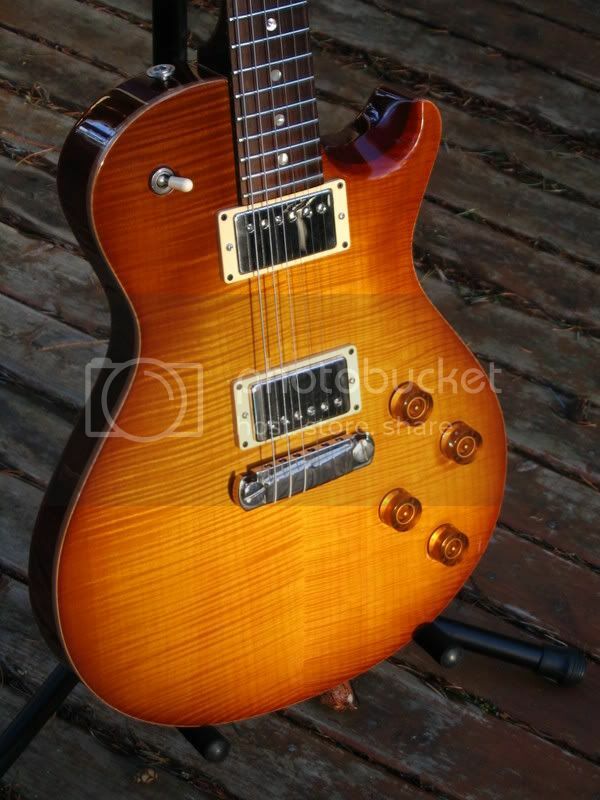 If I was to go for it I would have to trade my 2005 LP Deluxe and put in about £700, so my question is, is the above info correct and does it seem like a good deal? It's a fantastic guitar to play - lovely thick warm tone and would pair up beautifully with my new Shiva. Can you tell I want it? Sorry for the long post - thanks in advance. The pre-lawsuit part of it doesn't really matter anymore. Not knowing the European market very well, I'd say it still sounds a bit high to me. Doesn't this equate to roughly $3,700.00USD? the euro market is def more expensive than here in the US, definitely the UK anyways. although i think that does sound a little steep, the quality of the PRS will blow the gibson away. I have been very disappointed with gibson QC and overall quality over the last few years. At the end of the day, if you like the feel and sound of it more than your gibby, and can afford it, then go for it i say. There are several NICE ones available here in the States for around $2,000.00USD (used). Would it be cheaper to land on one of these and pay the applicable duties, shipping, etc? Edited to add: Don't let the "pre-lawsuit" hype get you. It means absolutely NOTHING. Here's mine. It's a 2001 w/ 7's. I love it. It's a 10 top and worth about $2300/$2400 here. Hope that helps. Its a wonderful guitar. It's not pre-lawsuit. I could be wrong, but the pre-lawsuit ones had adjustable poles built into the tailpiece. Pre-lawsuit does mean something. It means there's no chance the guitar is "weight-relieved". Still that price seems pretty steep. I'd agree that the price seems kinda high, but I don't know the market over there. I bought a SCT 10 top with gold hardware and birds used over here for ~$2K though. +100....They sound huge compared to the weight relieved ones. OBTW....$1450.00 +shipping gets you a 1st year "10" top. 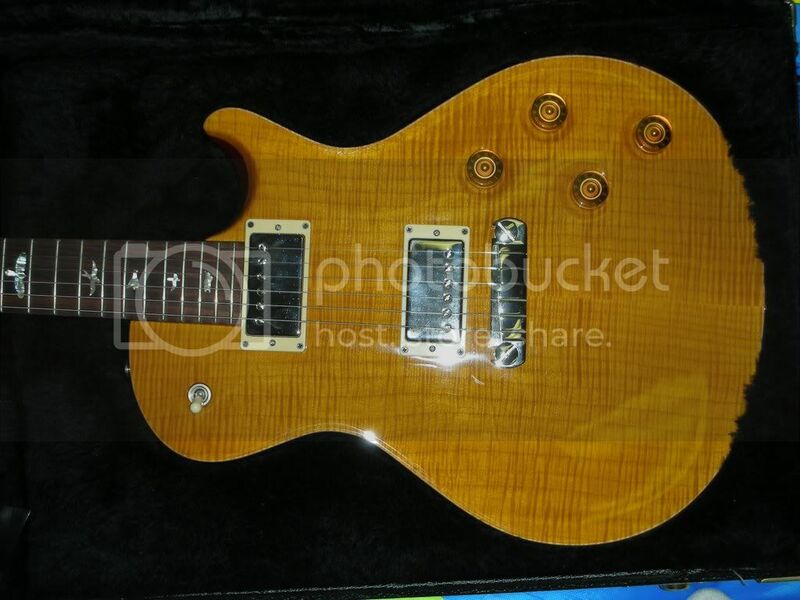 FS: 2000 PRS SC McCartyBurst,Moons "10" top !!!!! Got it in a trade....Great guitar sounds "HUGE" as most the early SC's do. Lightweight around 8-8.5 and as tight of a Flame as I've seen. The tuners have been changed to Sperzel locking and work great . Condition 8.5 outta 10 with NO fretwear. I has a couple bumps on the headstock ,but nothing down to the wood. PU's are #7's and the electronics haven't been touched. No hangtags etc and comes with a fit SKB case. I have too many SC's and need to pay for another!!! $1450.00(USPS MO's) + shipping FIRM. No trades TY!!!! PM me here or e-mail me @ toddaure@hotmail.com . Feel free to call me @ 206-380-7774 TY Todd. As far as shipping from the US goes I have no experince with this at all - anyone here done any transatlantic deals? Is it pretty painless? Singlecut02 - that is a beautiful guitar - you've got me thinking. I know I'd have to pay duty at about 3.5% and VAT at 17.5% equating to about £150 ($300) - do you have any idea how much the shipping would be? My point of "pre-lawsuit" meaning nothing is to the point of pricing. Don't overpay for the moniker because that's all it is. I shipped via USPS to Switzerland, safely, no hitches, for $160.00USD. It took 7 days.